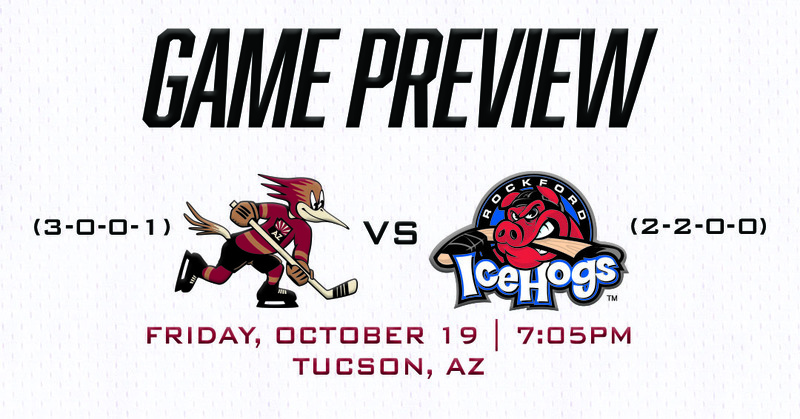 Kicking off a two-game home stand, the Roadrunners will host the Rockford IceHogs at Tucson Arena for the first time ever Friday night, marking the first of four meetings scheduled between the clubs this season. The IceHogs act as the Roadrunners’ 14th opponent in franchise history, and the first of two new opponents they’ll play this season. Rockford, coming off of a 5-2 victory over the Hershey Bears last Sunday on home ice at the BMO Harris Bank Center, have dropped each of their two road games this season, but enter the night with consecutive victories. Tonight marks the Roadrunners’ second home game of the season. The team, following up its 6-4 opener in front of a crowd of 6,327, earned five of six points in posting a 2-0-0-1 mark during a three-game road trip. Tucson remains unbeaten in regulation. A pair of former Roadrunners grace the IceHogs’ roster, defenseman Andrew Campbell and forward Henrik Sameulsson. 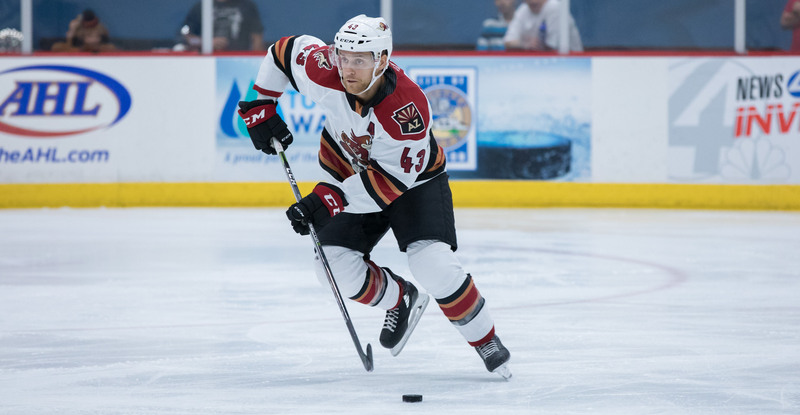 Campbell, the second team captain in Roadrunners history, is expected to trigger memories and emotions in his return to Tucson Arena this weekend. Forward Lane Pederson has eight points (1G, 7A) in the Roadrunners' last seven home games at Tucson Arena dating back to last March. DEPENDABLE DAKOTA: Defenseman Dakota Mermis, through the Roadrunners’ first four games, is averaging a point per game, totaling four (1G, 3A), including his first goal of the season Monday night in San Jose. Mermis is tied for second among all defensemen in the AHL with a +/- rating of plus-six. CENTRAL SUCCESS: The IceHogs are one of four Central Division opponents on this season’s slate. Last year, the Roadrunners earned points in 13 of 16 games played against Central Division opponents, posting a 13-3-0-0 record. Can the Roadrunners continue their winning ways outside of the Pacific tonight against Rockford? NINETY: 18 of the 20 skaters to have appeared in at least one game for the Roadrunners this season have at least one point, calculating in at 90% of the roster. Not quite as top-heavy offensively this season, balanced output has been a major factor in the team’s early success. Two players have four points, three players have three points, seven players have two points, and six players have one point.